Subject: Grant of financial upgradation under ACP/MACP Scheme and Non Functional Grade to Pharmacists. The issue of grant of ACP/MACP to Pharmacists on acceptance of Fast Track Committee Report, the Government of India, vide Min of Fin, Deptt of Expenditure F. No. 1/1/2008-IC dated 18.11.2009 was referred to our HQrs office for clarifications on the following points. 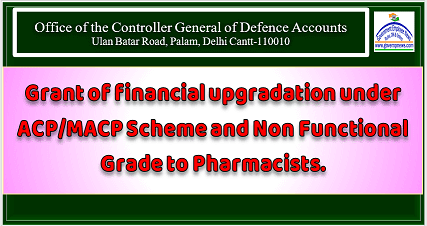 (i) Whether the pharmacists (GP Rs2800/-) who have already been granted higher scale/GP (GP 4200/-) by virtue of ACP or otherwise prior to effective date of OM dated 18.11.2009 are again to be allowed Non Functional Upgradation (GP 4200/-) under the above provisions. (ii) Further, doubt has been raised regarding mode of fixation of pay while on granting ACP after NFU, as in the case of Pharmacists, the scale/GP granted on account of NFU and the standard/common pay scales applicable for ACP in terms of Annexure-II are same and identical i.e. GP of Rs.4200/- in the PB-2. In this regard a copy of CGDA No-AT/Il/2458-XXIII, dated 01/03/2018 received in this office clarifying the above points is forwarded herewith for information and necessary guidelines. Subject: Grant of financial upgradation under ACP/ MACP Scheme and Non Functional Grade to Pharmacists. Reference: Your office letter No Pay/Tech-I/01 (6th CPC) Pharmacist dated 12-01-2017, 20-02-2017 and 14-09-2017. 01-2006 does not appear to be in tune with or supported by the orders regulating the grant of NFU. 2. Further, regarding second doubt raised by your office it is stated that the clarification given at S] No 2 of DOPT OM No 35()34/1/97-Estt (D) (Vol-IV) dated 10-02-2000 clearly stipulates that in cases where pay scale given as selection grade/in-situ promotion is not a part of hierarchy, the pay scale granted by virtue of selection grade/in-situ promotion may be treated to have withdrawn on grant of ACP. In View of the provisions ibid it is viewed that the pay scale/ grade pay of Rs 4200/- granted by virtue of NFU in the cases of pharmacists which is not a part of hierarchy may be treated to have withdrawn on grant of ACP. This has the approval of Addl CGDA (PP&W).